The last three days have been pretty busy ones again with so much seen and done. 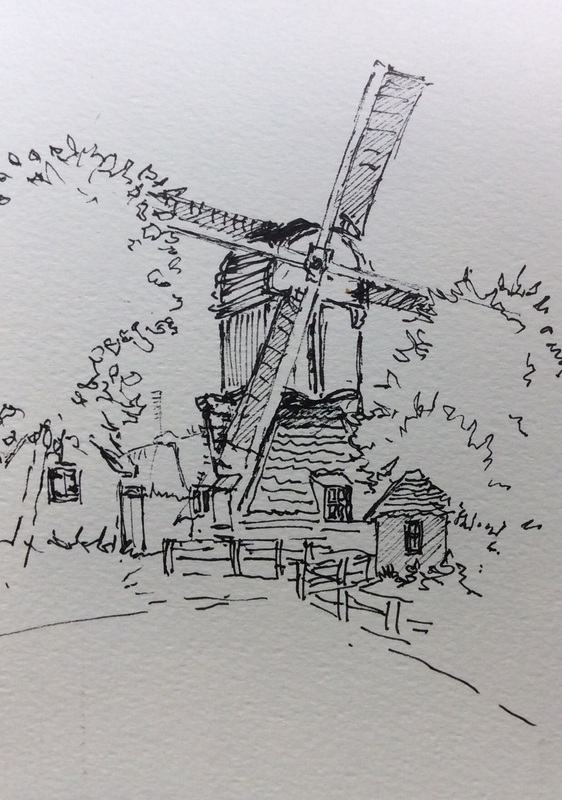 Our last day with our friends Jenny and Hein, and they offered to take us to Kinderdijk, a UNESCO world heritage site East of Rotterdam where, up to twenty, very old windmills are preserved in their natural setting. The site is a wet area with many drains and originally the mills were used to lift the water from the low areas. Windmills here have three different types of construction, some have stone towers, some have neatly thatched towers and the oldest are timber. We had a coffee under one which was working and the power is quite awesome, the blades very nearly touch the ground and seem very dangerous. A friend of Hein’s lives in Kinderdijk in a traditional house built on the side of a dyke, we entered the house from the top of the dyke into the formal area and the other rooms were below with each floor getting smaller. Chickens and goats still live on the bottom floor but this is more for the sake of tradition and they are pretty much pets. The house is quite small, but from the garden it has a very high brick wall as the house has four levels. The garden fronts onto a large pond and by Dutch standards is large. About 5pm Hein and Jenny took us to the station where we caught a train and with one change we got into Amsterdam about six. Amsterdam teems with people, particularly around the station and Paulette ran over several other people’s feet with her case in the 300 metres or so to our hotel. The hotel was a rambling rabbit warren in three adjoining traditional town houses and we were upgraded to a suite on two levels. On the lower was a small living room and the bathroom and up a spiral staircase, in the attic, was a very long and narrow room in the peak of a steep roof with a double and two single beds. I could not work out how they could have got the beds into the space. A heat wave today with temperatures in the thirties. We got out fairly early and wandered along canals to the Rijksmuseum which had been closed for renovation when we were here last. It’s another massive museum and, again, we restricted ourselves to seeing just the most famous works. Impressing us here were paintings by Franz Hals, Jan Steen and of course Rembrandt and Vermeer. They also have three or four of Van Gogh’s paintings. The afternoon was too hot so we took a canal cruise. It really is a lovely city. In the evening we had a sleeper train booked to take us to Munich over night so with no hotel room to relax in we picked up our cases and headed to the station with an hour or so spare but as the time arrived we found that the train was, first, thirty minutes, then fourty-five minutes. It was a boring hot wait with no seats available. A bit earlier, however, while having a kebab tea in the station we had a good chat with three delightful young people. One girl and her brother had an Indonesian heritage and all three were very interested in our holiday. The train was much as expected. We had a compartment with three bunks but very little space for our cases. The bunks were comfortable enough but the unfamiliarity of sleeping in a moving train meant not a lot of sleep for either of us. Interestingly the (very long) train started with three sections, bound for Munich, Zurich and Basel which were split during the night so we started with our carriage heading in one direction and arrived in Munich with it heading the other way. Arriving in a city at about 8am we couldn’t expect that our hotel would have an available room so we dropped our cases and headed into town. Munich was lovely at that hour with very few people so we strolled down a quiet shopping street which later in the day was heaving with locals and visitors. 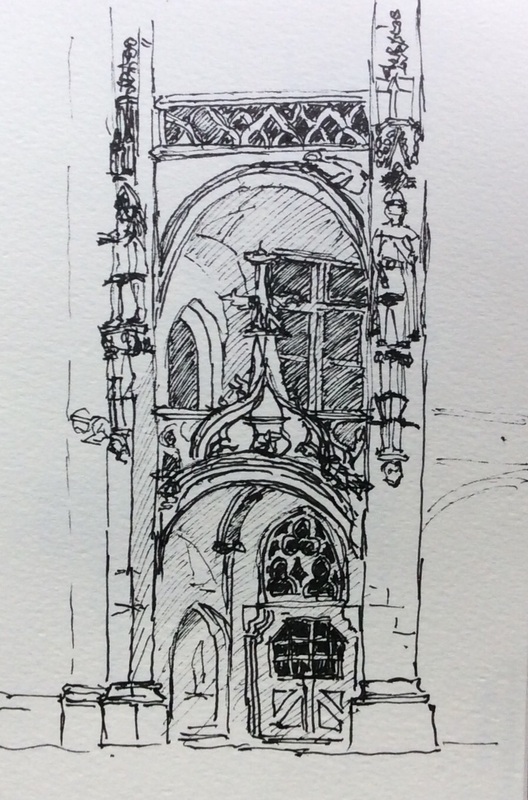 Marienplatz (the city square) has lovely buildings and we went into the courtyard of the Rathaus, where I made the above sketch before stumbling on the Viktualien Markt, a permanent food market where, by this time large groups had settled into the serious business of drinking beer. We got our room about midday and had three hours sleep before heading out again for dinner in a recommended Bavarian restaurant. Out choice of Munich sausage salad was not great, but nor was it expensive. Later we visited St. Michaels Church, our first baroque church and sat for a while listening to a choir practicing a traditional chant. The acoustics were amazing making it a magic moment. Raspberries and ice cream in a square with a large fountain (with children playing in it) ended a good day.